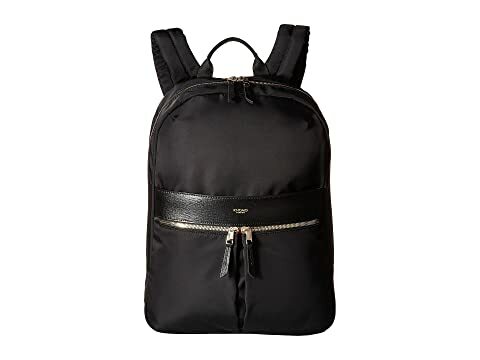 The sleek Mayfair Beauchamp Backpack by KNOMO London® is the perfect way to travel efficiently without cramping your style. Made from soft and sleek nylon exterior with saffiano leather trim. Laptop/tablet compartment with shockproof padded protection through sides & base. Bespoke gold-look hardware and a colorful grosgrain internal lining. Easy carrying with top grab handles and an ergonomic padded back-panel and adjustable shoulder straps the super-lightweight backpack will always be a comfortable companion. Store small items in the two front zippered pockets. 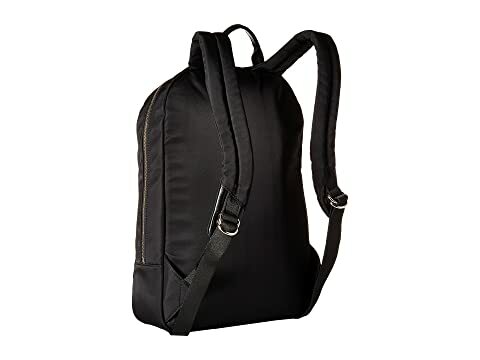 This backpack can accommodate up to a 14" Macbook® or similarly sized laptop computer or tablet. A spacious interior offers a padded laptop compartment, a tablet slip pocket, and a zip pocket.